For some, like the many abused, neglected or abandoned children taking up residence at A Kid’s Place, who have never seen their name in frosting or blushed during an excited Happy Birthday sing along, it is a commodity to feel special when turning a year older. 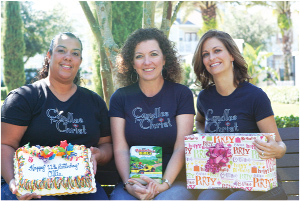 A new, local nonprofit organization, Candles for Christ, makes every birthday memorable for the children at A Kid’s Place, celebrating on their actual birthdays with a custom made cake, a gift and an age-appropriate Bible. Three FishHawk residents, moms and now nonprofit founders Donna Rose, Ingrid Velazquez and Melissa Martin embarked upon this endeavor together last year. Founded in March of 2010, Candles for Christ has documented celebrating 52 birthdays since November of the same year. Just this past July alone, the organization celebrated 13 birthdays, the most in a single month. Gifts are budgeted at $25 and thanks to Mary Berg from A Kid’s Place, whenever possible gifts are specific to the child’s request. “When time permits Ingrid makes elaborate cakes for the kids,” Rose said. Cakes have been baked in the shape of teacups, cars, Elmo, Cookie Monster, and even an artist’s palate. Last month, one seven year-old boy had just moved in to A Kid’s Place, his birthday was a few days later. Candles for Christ welcomed him with his first birthday cake ever and a gift on his special day. Candles for Christ hopes to expand its resources and begin offering birthdays for those in elderly homes who experience a similar coming and going of their birthday. As for the children at A Kid’s Place, Rose said, the ladies hope to remain active in their lives. “We would love to be their cheerleaders and provide encouragement and whatever else they would need as they transition out,” she said.